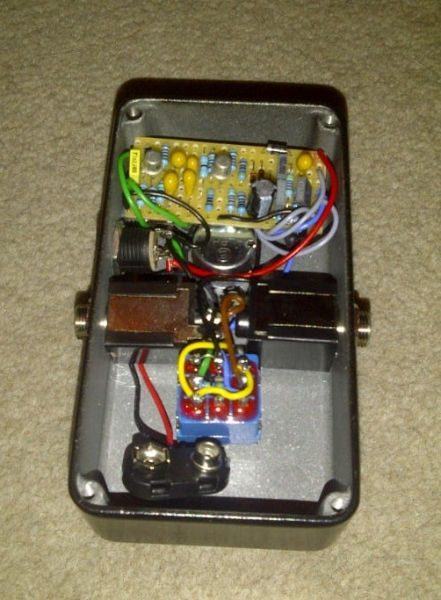 The legendary Burns Buzzaround was a slightly unusual germanium fuzz that achieved its (undeserved) reputation for two reasons - some great guitarists used them, and they are virtually unobtainable. The original consisted of two stages - a two-transistor amplifier and a distortion stage that could have both the amount of signal sent to it and the bias point adjusted by external controls. The third control was a crude tone control which fed the output. Originally, the output was unbuffered, and the leads and amplifier following would load the unit, and the top end would be rolled off, and often the tone control would have little effect. The first stage in the sound-alike is just a high input impedance op-amp gain stage. 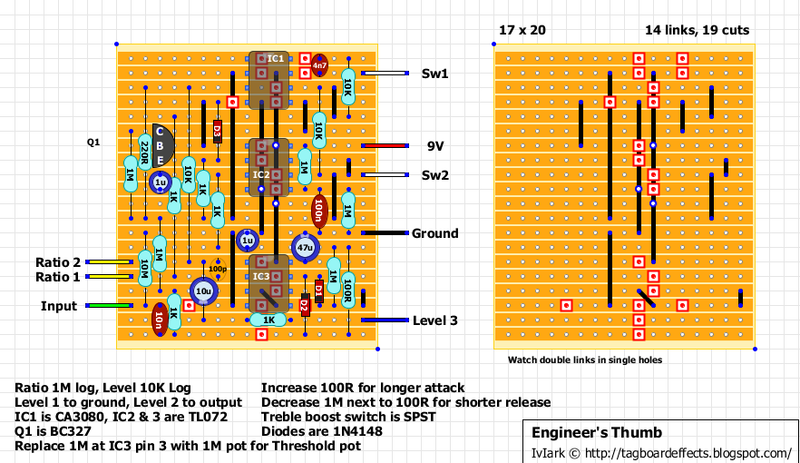 You may wish to increase the gain by increasing the value of the feedback resistor, but it sounds pretty good as shown. In the original, the first stage didn't really have much effect on the sound - it just amplified it enough to drive the following stage into conduction. The heart of the beast is the germanium transistor stage. Apart from using an NPN transistor, this remains true to the original (why screw up a classic? ), and still gives a wide range of sounds from the thin toppy fuzz beloved of sixties bands through to gated spluttery farts, with smooth warm distortion sounds in between! The final stage is just a buffer - it isolates the tone circuit from the outside world, and allows a full range of control from muffled to glass-shattering! 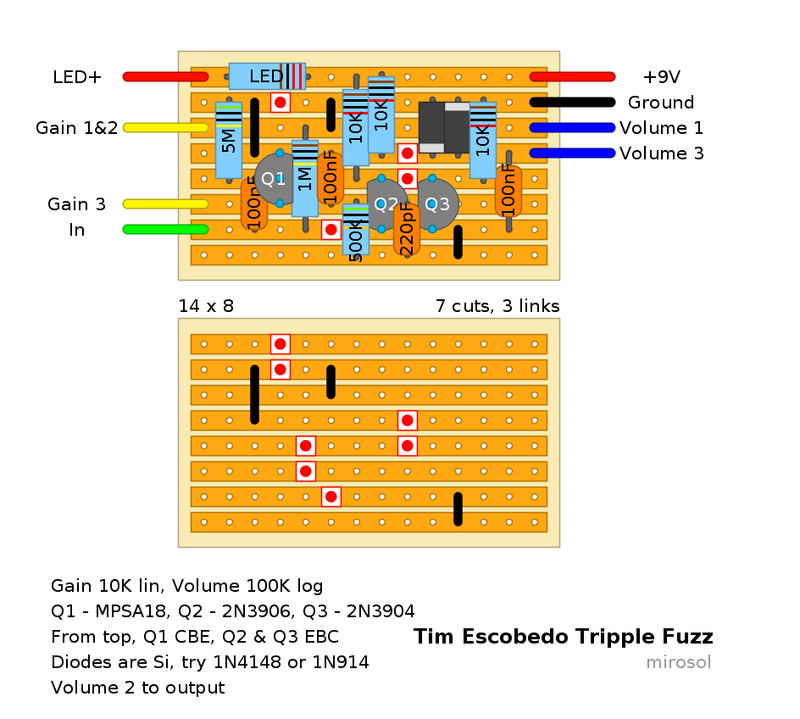 When i started to draw layouts, i did draw something like 10 of vintage fuzzes that weren't published on this blog earlier. I build most of them and that's when i realized why they weren't posted. Most of them are pure crap. For those who are after "that 60's sound" - the ear piercing super thin fuzz (or just plain ugly IMO) could be satisfied with Shin-Ei and Maestro fuzzes covered here. There are many, but i find only a fraction of those circuits to be any use. For example, the stock version of VOX distortion booster is really not worth your while. I can only speak out my opinions, but the same applies to most Maestro and Höfner schematics out there. 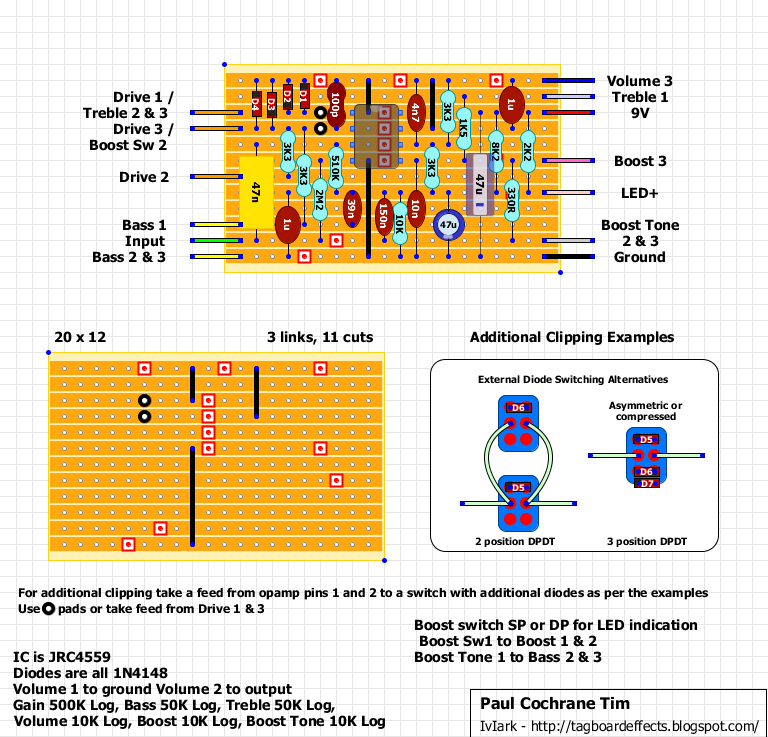 But in search for good little fuzz circuits to practise my layout drawing on, i found Tim Escobedo's circuit snippets. These are generally just proof of concept circuits and thus, not necessarily finished products. This particular one just sounded good to me. It offers plain Elektra distortion-like, boring, but usable distortion with gain at zero. Fuzz rises with a turn of that knob, finally resulting in something really sick with massive made up overtones. It is basically a frequency tripler :) So i though i'd share this one too. "This is a fuzz using a "nonselective frequency tripler", originally designed by R. Lockhart Jr. At low gains the sound can be very sweet. As the gain rises, you get a odd splatty fizz going on. And at max gain it's completely nasty. A nice, easy build." 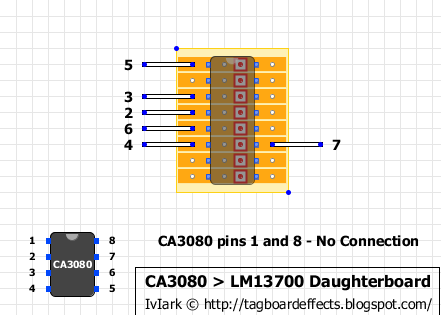 Request, with CA3080 instead of LM13700 (but you can use the conversion daughterboard to allow you to use the LM13700 if you prefer). Despite its final simplicity, I went though just about every possible configuration of OTA while chasing acceptable performance. As you can see from the schem, the OTA is working as a current-controlled resistor in the feedback loop of an opamp. This reduces the contribution of OTA noise. The input signal is also coupled directly to the side chain, which consists of a precision rectifier (U1b) and precision current source (U2a) that dumps more current into the OTA control pin as the audio signal gets larger. The ratio control blends compressed and uncompressed signals, so its variable from zero to infinite ratio (limiting)! 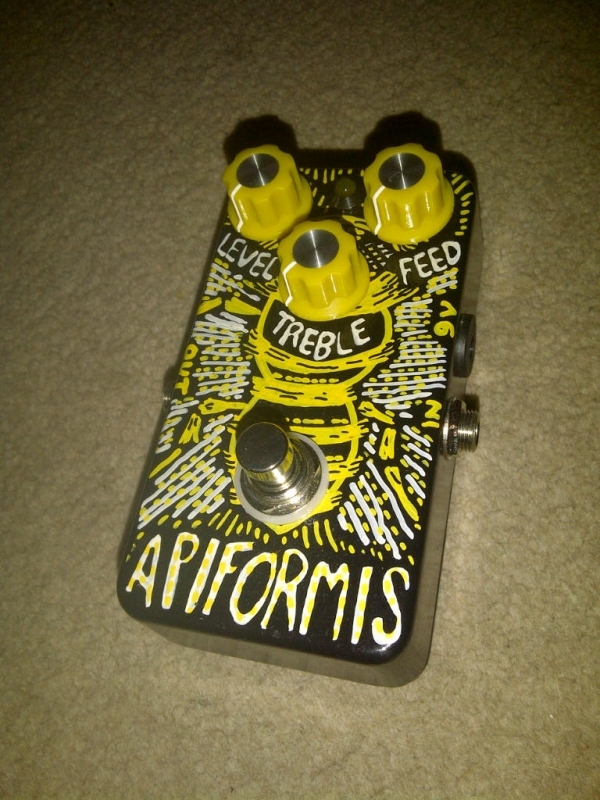 Apiformis Fuzztortion is a pedal that is quite unlike it’s original idol. In it’s heart, it is a dark low medium gain fuzz/distortion that has delusions of grandeur about being an overdrive. And it is doing all that with vintage-like touch, from doomy dark to brightly overdriven, distorted fuzz with vintage, medium sustain. 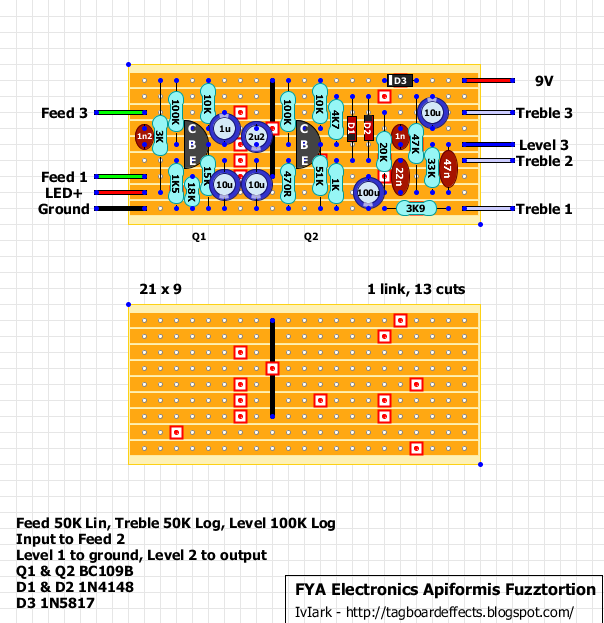 FEED: Controls the load on the input (impedance). From dark, low saturation (0) to medium fuzz (5) and finally full sustained distortion-like fuzz (10). Lower settings can lead to oscillation, which is a feature. 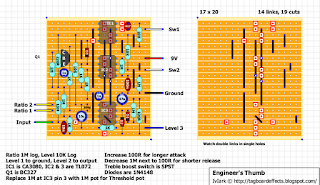 TREBLE: Controls amount of higher frequencies boost on the tone. From dark, nearly muddy (0) to open higher mids (5) and finally to fully boosted top end (10). LEVEL: Controls the output level of the effect. Level at zeron means that there is no signal passing through. Unity level with bypassed signal comes in with knob on ~11 o’clock. There is plenty of room for overdriving your amp with higher settings of Level control. Part 2 of the component guide by Miro, this time looking at active components. A good read particularly for someone new to the hobby may have a lot of his questions answered. Good day to you all. This article here is the part two of my component tutorial, aimed for the beginner builders. I've already disclosed the reasons why i'm doing this in the first part of the series. If you're asking me how many volumes i'll write; i really don't know. When i run out of steam i suppose. Anyway. Let's start with diodes of all types and go on to the transistors. Diodes aren't exactly active components in meaning of the word, but they still are semiconductors. 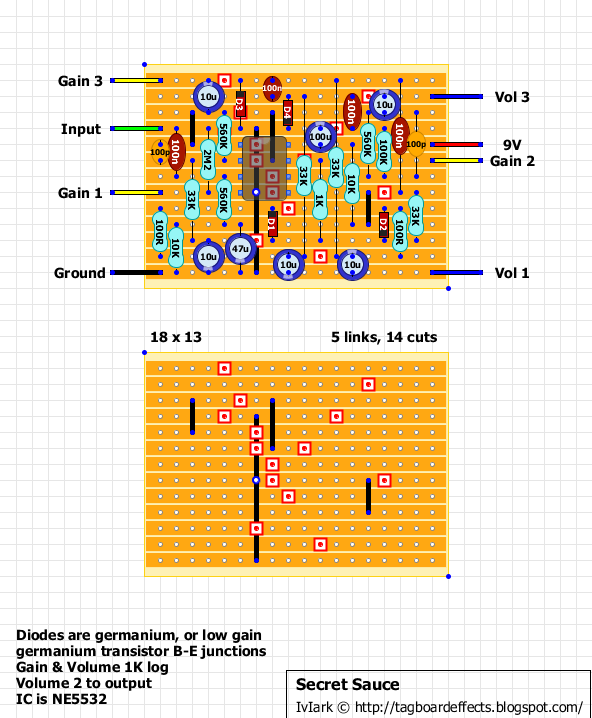 Where resistors slow down the current, diodes can do the same to voltage. But they can do more. We have a few different types of diodes, and they all have their own purposes on the circuits. From light emitting diodes to standard switching diodes to schottkys and zeners and so on. Wikipedia entry for diodes shows the magic-like list of all the different types imaginable. All diodes have anode and cathode. Laymans terms, the anode is positive and cathode is negative side. So if you will, these are polarized in the same manner as polarized caps. 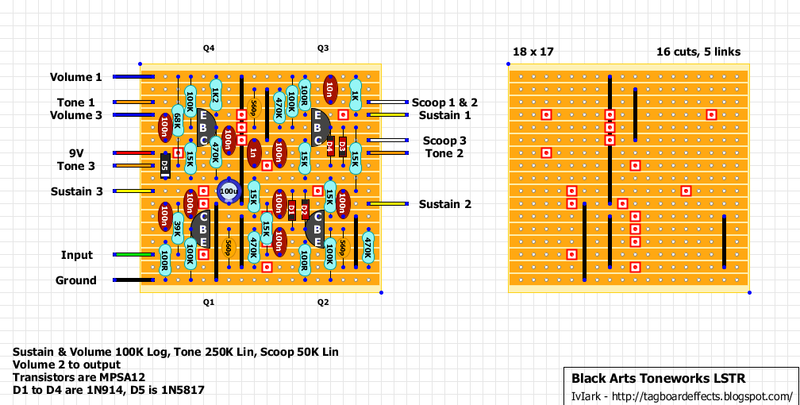 We'll be mostly needing LEDs, schottkys and switching diodes for our builds. But let's not get ahead of ourselves. LEDs are diodes too. Hence the name. We have usually two different purposes for the LEDs in our circuits - First, we use LEDs outside the boxes to tell us when the pedal is on. Other viable and common use is to clip the signal with LEDs. 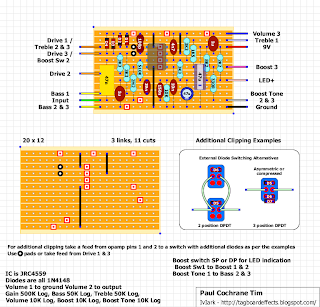 If you see two LEDs on a board, connected back to back, then that's the clipping stage created with LEDs. They come in variety of sizes, shapes and colours. Most common are round 3mm and 5mm LEDs. There are 8mm and 10mm round LEDs available too. And the LEDs come in various packages, or shapes, like square style, short hat... Note that the longer leg is always the anode (the positive, "+" side) and the shorter is cathode (the negative, "-" side). You can find a vast variety of different colours, diffused and "water clear". Clear ones are usually brighter, and they usually need higher resistance to produce same ammount of light than diffused ones. By the way, the resistance between power souce and the anode (or in some cases, cathode and ground) means how bright or dim the LED is once it's on. Diffused ones are coloured and clear ones are just transparent, no matter what's the colour when it is on. You can find red, green, yellow, pink, white, blue, orange and more as diffused and clear. Note that usually the pink, white and blue are more expensive than red, green and yellow. There are good(ish) starter packs out there, but usually their prices can be beaten by just checkin some cheap part store like Tayda. You probably want to have many different colours in stock. Well. We also have multicoloured and other special LEDs out there. These have either common cathode or common anode. Which you might need depends on where you're going to use them. And how. One purpose would be to use two coloured LED as indicator in build where you may have two circuits in a single box. That would need common anode type. Anode feeds the current for both colours and two anodes go to their respective switches to be connected to ground. But. I bet there's enough to learn with basic LEDs as these are much more often used in our purposes. It may be good to start with stocking up on your favourite colours in 3mm and 5mm, diffused or not, that's, of course, based on what you like. 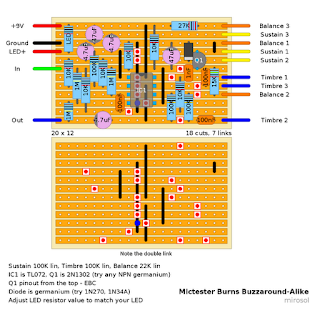 As i mentioned above, LEDs are also commonly used as clipping diodes. Different colours have different and distinct tonal differences. Colour makes more difference than the size than shape of the LED. You can always socket the two back to back clipping diodes on your build and try out different combinations. For example, red and blue sound completely different. That's one more thing to try out. *Hint: Try out one red LED straight on to a 9V battery. Longer leg to plus terminal and shorter to minus. This experiment will cost you one 2-3 cent LED, but you'll never forget to use a resistor between the power source and the LED. Many designs use 1N5817 or 1N4001 schottkys as polarity protection. You might want to stock up on those too. The latter drops more of the voltage than the former. But former costs a lot more in comparison. If schematic or layout has 1N5817 in it, you can safely use 1N4001 in its place. In theory, all barrier schottkys are meant to pass the current 1:1 on the "right" direction and stop the current from passing in the wrong direction completely. This is the basic operation of all diodes. Ah, but then we have all the magic diodes. Germanium diodes, like 1N34A, 1N270, OA91 and super lenghty list of others. The list goes on forever. Foe example, 1N60Ps are quite cheap and they are good to have. Others.. Well. A diode is a diode is a diode. For clipping stages, you'll get tonal differences with different diodes, but the rule of thumb is that germanium diodes will always be more quiet than their silicon counterpart. Germanium diodes cost roughly at least seven times what modern silicon diodes cost. And for NOS, the prices go through the roof. If the design has two 1N270s (like, for example, in DOD OD250) in it, you won't be totally off by swapping them with two 1N4148s. It won't sound 1:1 with the original, but i can promise you that this is something you will want to try eventually. Some designs use zener diodes. These are more special cases. I personally don't see the point in sourcing and stocking all the possible values from 1V to 36V and beyound, as you'll probably need just 4,3V or 4,7V, 5,1V and 9,1V zeners in your first year(s) of building. It's really rare that some application needs exactly 4,7V zener - in my experience, the circuit will work fine with 5,1V zener in it's place. So just like with the humble resistors, you can always use the closest value you have at hand. All of the above are marked with a stripe, regardless of the package. The stripe marks the cathode side of the diode. Did you already forget? Cathode is the negative (-) side of the diode. It's the anode that is positive. As diodes go, they are generally somewhat cheap components and easy to stock up on due to wide availability. 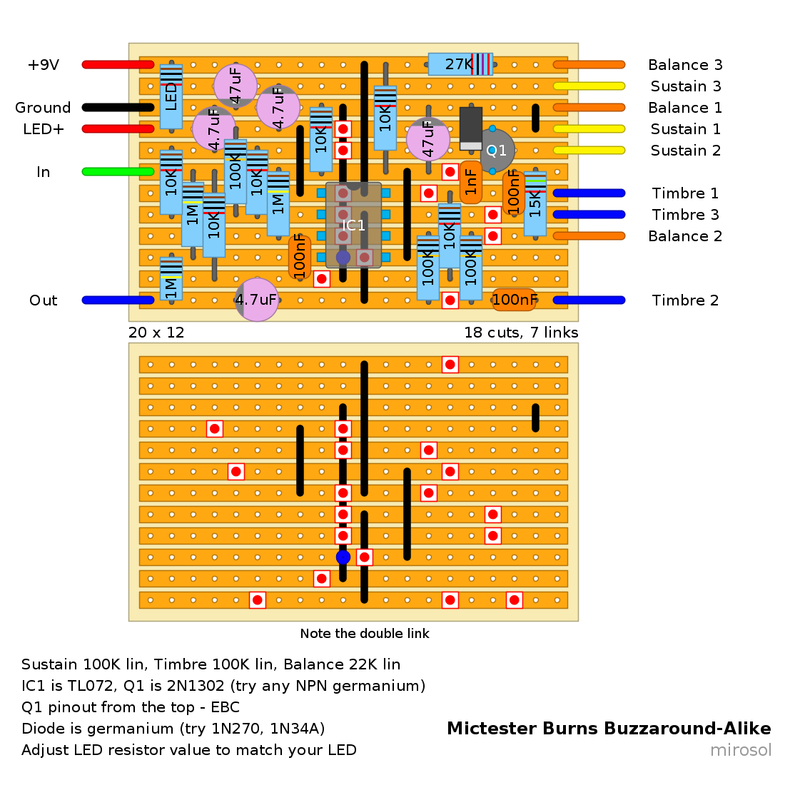 So, in addition to LEDs, you'll need at least a fair batch of 1N4148s and 1N4001s. In addition, some zeners won't hurt you. But you could always stock up on all of them..
Now we're getting to the point where the real magic happens. Well. It's not that much of a magic than just plain good old physics. Transistors are used to amplify the current - which in this case is our signal. All transistors work in the same general principle - turning signal's current to stronger current with help of voltage, bias voltage and ground. This is the point where i urge you to always check the datasheet. It's easy. Just fire up google or any other search engine and type in the model of the transistor and a word "datasheet". Once you've done that several times on one particular transistor, you'll start to remember stuff like the pinout and hFE (which is the number that tell us about the transistors real gain). Ok. Transistors are discrete devices that can amplify our signal. There are too many models and too many little differences between them to list them all. But the things we need to know are that we are commonly using BJTs (bipolar junction transistors), which is just referred to as, well, the transistor. Then we have MOSFETs and JFETs. Those are the most common three. Or the transistor. It has always three legs. One is called the collector, one is called the base and one is called the emitter. That's at least three legs. Transistors with four legs and some other special ones with two bases exist too. Usually we're going to need the basic ones with pinout like emitter-base-collector or base-collector-emitter. One great discovery happened when former me ordered a silicon fuzz face kit. Former me opened bag and was baffled. "Did they mistakenly send the wrong transistors? Are these germanium instead of the silicon i ordered? I don't know what to do!?". Check the datasheet you idiot. Silicon bipolar junction transistors come in variety of packages. The metal can does not automatically mean that the device is germanium (i'll tell you more about the germs later). 2N2222 come in TO-18 package, which is metal can. BC108, BC109, 2N2907 and massive amount of others come in TO-18 as well. And they all are silicon devices. Normal black plastic package, the TO-92 is used in more devices though. Metal can gives the mojo feeling to a transistor. In case of 2N2222(A), you can get both packages, the TO-18 and TO-92, and it's still exactly the same device. There are others like this too. Now.. What's the deal with NPN and PNP? Doesn't that make all this a bit complicated? Yeah. I guess it does. At the beginning of the building hobby it surely does. Well it's quite simple after all. It is affected by the direction of the current. That's why normally we'll need negative 9V with circuits that are using PNPs. This is one of those things that is slightly too complicated to unleash on a beginner. 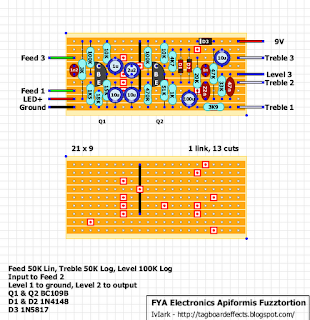 Anyway, I suggest that you familiarise yourself with NPN transistors and negative ground builds until you are sure you can take on PNP designs. 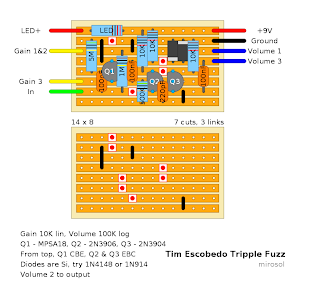 *Hint: Build yourself a silicon Fuzz Face clone with two 2N3904s. That way your parts on the board will cost you less than 15 cents. 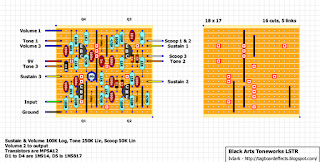 That doesn't include the board material, pots, wires, footswitch, nor that possible trimpot. And it won't sound anywhere near the classic germanium AC128 Fuzz Face. But. The parts for the board still cost you less than 15 cents. NPN and PNP is the same thing with germanium transistors. Germaniums are currently used in pedals and not much elsewhere. They leak current. Even the best ones do. That's the fault that guitar effect designers have used for their advantage since the sixties. Plus the fact that silicon devices, invented in 1954, were expensive at the time. That's the main reason guitar effects used germanium transistors for so long. Then you might ask why most of the germanium circuits are PNP? Well. History has it that most PNP germanium device models were much more consistent than their NPN counterparts. NPN germaniums exist. Good ones are just mostly gone. If you check the ebay for NPN germaniums, there are some, but they cost a lot more than PNPs of the same gain range. I've hoarded some germanium transistors, and i can tell you that none of the germanium transistors are consistant enough to just take from the bag and rock. It never works that way. Only measuring the gain and compensating the leakage in that measurement can lead to working germanium build. Anyway. 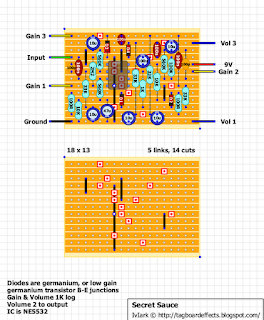 Good way to start out would probably be with the common NPN bipolar junction transistors and when you feel ready, then get your hands dirty with PNP and germaniums. Germs sound amazing due to their faults, but you may have to pay up to 500 times more for basically inferior device. Always check the datasheet. That is the one message i can't repeat enough. What we want to know from them are just a) The pinout, and b) hFE=gain range. Those two are the ones you'll need over and over again. There is always way too much information on those documents, but you will manage fine with those two pieces of information. *Hint: If fyou store all your different transistors in small plastic bags (like i do), you could write the basic information you'll need on the bags. Like for my bag of 2N3904s: NPN - EBC - ~300. Then i know straight away the pinout and general range of hFE. Another type of BJT is the Darlington. Darlington is a device that basically has two normal BJTs piggybacking inside one transistor box. That configuration can lead to massive gains, like 20000 (twenty-thousand) hFE. Some manufacturers, like Devi Ever and Death by Audio seem to be in love with these. Basic two models would be 2N5306 and MPSA13. Both good sourcing targets. Wikipedia has nice article about the Darlington configuration that explains a lot. Just a hint for those who are interested. JFETs and MOSFETs? Why on earth we do have so many different types of transistors? Well, the operation is quite different between bipolar junction transistors and field effect transistors. More importantly, the sound is completely different due to different bandwidth. FETs alledgedly sound nearly like tubes. That is not completely off, as you can get tube-like sound from these transistors and they were supposed to be solid state replacement for tubes to begin with... In harsh reality, only thing that sounds exactly lika a tube is a tube. FET's operation is based on electric fields, but that's a bit steep for now.. FET is older invention than BJT, but mass manufacturing of these devices started some time after BJTs. So, FET stands for Field-Effect Transistor and MOSFET for Metal Oxide Semiconductor Field-Effect Transistor. MOSFETs are notoriously delicate to high voltages. Even simple static charge can kill the device, so handle those with care. Pins of a FET are called the Drain, Gate and Source. Those translate loosely to drain being like the collector, gate like the base and source being like the emitter on a BJT. Usually the pinouts are drain-gate-source and gate-drain-source. Like i said above, the characteristics of a FET make it sound much more like the vacuum tube than squeeky clean counterpart, the BJT. FETs do not have hFE to tell you the gain. That is listed as IDSS and GFS in their datasheets. Those translate to current being put out by the transistor. Basic and the most popular devices are without a doubt 2N5457, 2N5458, J201, MPF102, 2N7000 and 2N5259. There is much much more to FETs, as this is just a short introduction. FETs sound amazing in many applications and they are somewhere between germanium and silicon BJT when it comes to ease of use - Silicon BJT being the simplest and easiest device to build circuits with. FETs can be used for clipping too. You could try them with source as anode and gate + drain as cathode. This will result in soft clipping. Once again, tube-like soft clipping. There is a huge number of different types of transistors out there. Radio frequency and microwave. Exotic semiconducting composite materials, like hybrids between silicon and germanium and so on. And while we do use them mainly for amplifying guitar or bass signals, they can be used for other purposes too - like electronic switching. This Christmas, as usual, I'm going to ship a few pedals to a few friends as presents. This year's project is a slightly unusual one because it has germanium in it.... Usually, I hate germanium devices, but in this case, they give the pedal a sound all its own. It doesn't sound much like anything else out there, but you've already heard this on a few records! Possible modifications include the addition of tone controls at the output end, changing the feedback resistors around the op-amps for more or less gain, rolling off the output by increasing the capacitor in parallel with the feedback resistor.at the final op-amp..... As usual, the circuit has a high input impedance and low output impedance, but has a solid copper bypass because that's what seems to be wanted again at the moment.